Holidays are in full swing, and in the midst of all of the festivities my sister and I are actively looking to buy a place downtown. This is great, with one exception; we are leaving our rooms that have been converted into walk-in closets and garage walls lined with shoe racks (thanks Dad) for a much smaller space in beautiful Edmonton downtown. Storage will be an issue but furniture shopping and getting to design a new space is so exciting. I got a chance to partner up with Design Within Reach to show you some of their amazing furniture pieces that are on my wish list. DWR makes authentic modern design accessible. They were founded in 1998, at that time the classics were very difficult to find. DWR changed that. They made innovative works by iconic designers accessible for the first time, and they continued to offer the best in modern design – past, present and future – ever since. In other words, they make design within reach. This bedroom is simple, practical and elegant. I will take on of each please! This Matera Bed with Storage would work wonderfully in our new small apartment. It offers lots of storage, its unique yet modern. The Matera Six-Drawer Dresser & Nesta Rug complete the look. This bedroom give you ample storage and the carpet makes it cozy and comfortable. Everyone needs an office. Well, I do for sure, as I currently blog while sitting in bed, which is nor practical nor recommended. This Renew™ Sit-to-Stand Desk and Eames® Aluminum Group Executive Chair not only offer authentic edgy design but are practical. Both the chair and the table can be adjusted for your comfort and support. 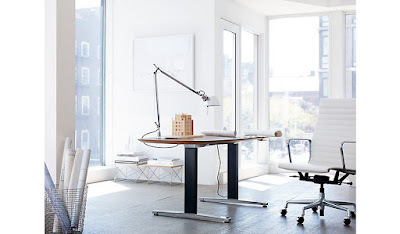 I love the fact the desk can be raised so you can stand; sitting all day is not fun, having an option to stand and work would help you stay healthier and more engaged. DWR is currently having a winter sale. What is on your DWR wish list? This post was sponsored by DWR and Shopping Links .